Trohanis TA Projects at FPG Child Development Institute is dedicated to improving the availability and quality of services, and ensuring optimal outcomes, for very young children with, or at risk for, disabilities and their families. 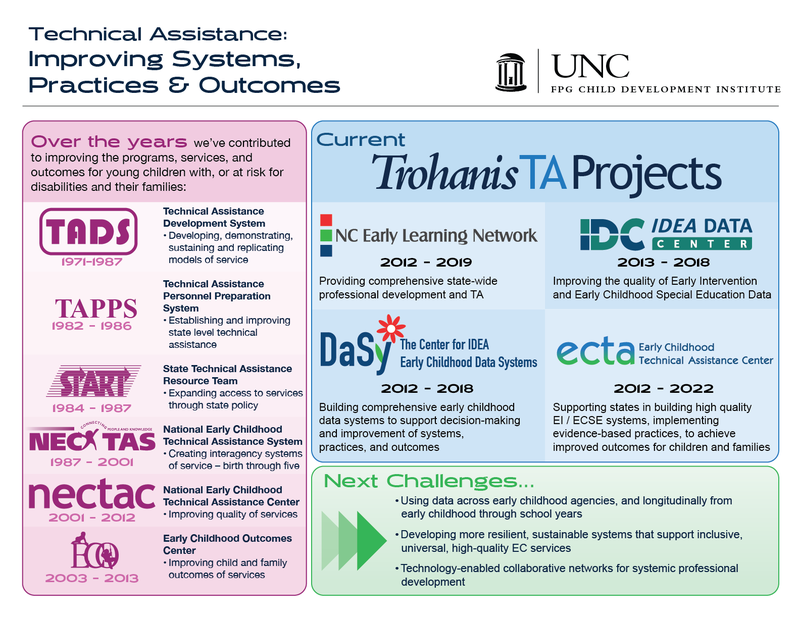 We assist states and local agencies that provide early intervention and early childhood special education to implement evidence-based practices, develop and manage effective and efficient systems of services, coordinate inter-agency programs, develop data systems and improve data quality to improve services and outcomes for infants, toddlers, and preschoolers and their families. This poster depicts the history and legacy of Pascal "Pat" Trohanis' projects at FPG.